Sending our warm candle night to disaster victims. On March 11, 2011 a magnitude 9.0 earthquake struck Northern Japan, followed by a powerful tsunami, and a severely damaging a nuclear power plant which continues to leak radiation. This unprecedented disaster has taken many lives and livelihoods, leaving scarred land and hearts of the people. However, many have risen beyond this challenge and are beginning the long road to rebuilding what they have lost. We have been touched by their courageousness, and would like to express our continued support by organizing this Charity Candle Night. 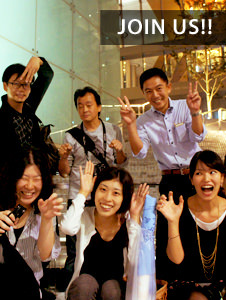 In a joint effort, Omotesando hosted this charity event with all proceeds donated to the rebuilding effort. Because of energy concerns, recently, this tree-lined street is darker than usual, but in response to the rebuilding effort we light a candle for you. The day of the Candle Night Event included the following 4 main attractions: Candle Installations, Original Lanterns designed by local art university students, a Children`s Parade of lanterns, and the Candle Cafe Network. 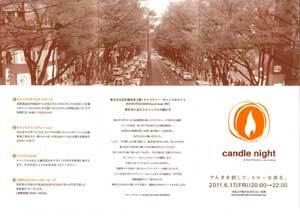 This year there were 9 candle installations along Omotesando. However, this year was a year for participation and most installations were interactive installations inviting visitors to write messages or designing simple candle holders on the spot. Because of energy concerns from the earthquake and nuclear power disaster, Omotesando was lit down and a little darker than usual so the flickering candle flames of the installations really attracted a larger crowd of people who stopped to take pictures and view the installations. There were 45 original lantern designers and 150 volunteer staff on the day of the event to carry the lanterns up and down Omotesando. The original lantern theme this year was “Sending warm candle light to the disaster victims.” Also the lanterns were simplified to a shopping bag or a simple hand-held format. Interesting designs included a jellyfish lantern, glowing houses, birds, and playing cards. Along with the installations, the lanterns were carried up and down the darkened street attraction much attention and photo opportunities. Also, donation box-style lanterns were located at each installation and the student volunteers asked for donations to help the earthquake disaster victims. Donation booths set up in the dark is unusual situation, but the donations box`s intense glow attracted lots of loose change. The lantern style donation boxes were so unique, that It seemed as if the donations were being thrown into a pit of fire. We appreciate all of those who generously donated to this charity event! Thank you! The candle cafe network was reduced to 8 cafes along Omotesando, emphasizing high-quality candle design over quantity this year. This year the designs were all candles and no LEDs were allowed. This presented a real design-obstacle for the students, but tested their creativity, too! Again each candle was designed with the thought of sending warm candlelight to the disaster victims and many unique and simple designs were produced. Because of energy concerns, the street and cafes were darker than usual and the intense glow of the candle light really stood out. We hope this warm, flickering symbol stirred cafe patrons to think about the meaning of Candle Night and the disaster victim’s still living in make-shift shelters. A different place with different people in simple candlelight can stir thoughts and emotions that are suppressed during our day-to-day life. About 50 students from the Jingu-mae Elementary School attended the pre-event workshop to craft tree motif lanterns to carry in a parade on the day of the event. The lanterns were very big this year and tested the creativity of the children, but each lantern was designed and finished and proudly shown-off by each child. On the day of the event, the children gathered again with their lanterns to parade up and down Omotesando. Once each lantern was lit with a candle the parade started and the chic shopping area was transformed into a flickering procession of cute lanterns. The parade ended in the small plaza and the children placed their tree motif lanterns around other building motif lantern to create a small glowing neighborhood installation.